Embryo @ 6- 7 weeks | Flickr - Photo Sharing! 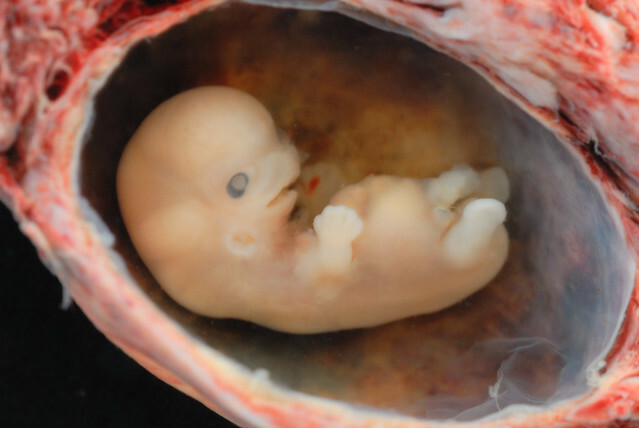 Approximately 6 weeks estimated gestational age from conception, 8 weeks from LMP. Shot with 105 mm Micro-NIKKOR lens with 2 off camera SB-800's. Specimen is submerged in alcohol. giupaint, garreyf, loxosceles, and 27 other people added this photo to their favorites. This is a spontaneous (ie. not a termination) abortion. It was extruded intact with the gestational sac surrounded by developing placental tissue and decidual tissue. This was carefully opened to avoid damaging the embryo. Hi, I'm a Wikipedia's User and I was searching photos for Wikimedia Commons, and I've loved your pictures. Are you interested in releasing this picture under Creative Commons-Attribution-ShareAlike (CC-BY-SA) license? In case you liked the idea, please open the photo and in the right bottom side, under "Additional Information" you will find "© All rights reserved (edit)", please click on edit and in the "Set a license for this photo" please choose "Attribution-ShareAlike Creative Commons". Only Creative Commons BY (Creative Commons Attribution license) or Creative Commons BY-SA (Creative Commons Attribution ShareAlike) ( please see creativecommons.org/about/licenses/meet-the-licenses ) are accepted. PS: I need this license confirmation to upload the image in Wikimedia Commons servers; otherwise the system will recognized this image like fully copyrighted and refuse the upload. thanks for answering; I'd seen abortion material that looked similar but was less intact. I'm glad this woman didn't lost her uterus as well. Your photography is unique - thanks for posting. Thank you for releasing this picture under Creative Commons BY license. What a great photo. Thanks for sharing. I hesitate to upload many of mine because most of my contacts get "grossed" out. Hi. Is this 6 weeks after fertlization, or instead 6 weeks LMP? 6 weeks from conception, 8 weeks from LMP. Please also see two other 8 week from conception and 10 week from LMP also in my photostream. Thats a great picture. Its amazing to see the human body and all that goes with it. I agree... from conception... a human!! May I use this image for a blog I am writing in HubPages on being 6 weeks pregnant? Any idea what caused the miscarriage? Strange question, but how long would a fetus of this age be? And how long would a 7 week, 8 week, 9 week fetus be? Cheers! Found this image on this website!! Very exciting! lunar caustic what's a spontaneous abortion? Thank you for providing this image under a creative commons license.